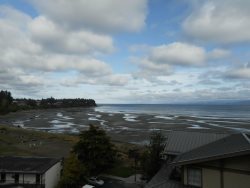 This cottage is a short 10 minute walk from Rathtrevor Beach and park. It is very centrally located on Vancouver Island, in Parksville, BC, which enables you to do short day trips to explore the many wonders of the island. You can take in the sights in Victoria to the south or surf in Tofino to the west, both of which are just 2.5 hrs away. You could enjoying a round of golf at one of the many courses just a short drive away. There are many parks, family activities, and restaurants nearby. You could enjoy downhill skiing or snowboarding at nearby Mount Washington, or mountain bike the same mountain in the summer. You could also shop to your hearts content in nearby Nanaimo, or maybe go out for supper and then a movie before coming back to your cozy cottage just a short 20 minutes away. Maybe you would just like to hang out at your cottage and enjoy the Mini-Golf course right next door or maybe go for a swim and then a dip in the hot tub in the recreation center just a few doors down. With all that there is to enjoy in Parksville on Vancouver Island, we are sure that you will have a vacation that you will remember for years to come.